In his true form, Director Bones really is all bones, and he's not happy about the return of Felix Faust. 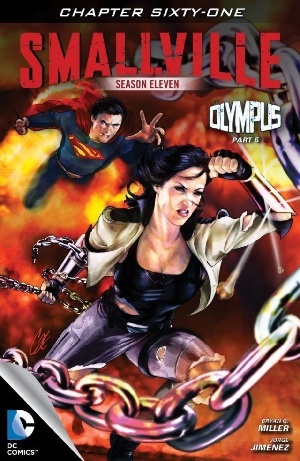 Lois and Clark are on Faust's trail, Martha lends a hand, and the trail leads back to Diana. Off goes Superman to talk to her. Bones and Faust meet in the Rotunda of the U.S. Capitol Building and Faust makes it clear that he has the upper hand, injuring Bones and demanding that he arrest Diana who, meanwhile, has snuck into Steve Trevor's apartment while he's taking a shower. After the brief violence of a misunderstanding, they cheerfully and tearfully reunite, just as Bones shows up outside Trevor's apartment building to place her under arrest. The exposition box in the opening panel might as well be a direct response to all the harping I did on the inconsistent and redundant use of this kind of device (including out-and-out name labels, which seem to have disappeared altogether) back at the beginning of the series. I mean, I'm sure it's not at all because of me, but there's nothing intrusive or redundant or (yet) inconsistent about using that ellipsis after "The office of" to lead directly into dialogue that confirms the identity of the character shown in the panel, and I thus have to call it good stuff. Lois's line, in reference to Felix Faust, "As fishy a wizard name as there ever was," which, for me, goes right back to my comments last week about how "Faust" is kind of a cliché. Art imitating criticism. John Barth would be proud. Here's what I didn't much like about this outing: Martha as a badass hacker wiz complete with close-up knuckle-cracking moment. Why not just have Lana pop out from behind the curtains and take care o' yo IT business, y'all? Or Pete, taking names and chewing gum. Because I don't know about you, but at no time during the "Red Queen" business did I ever get the sense that Martha's capacity was in anything more granular than working her new Senate connections and influence and a certain willingness to get her hands dirty when Clark needed direct protection. But, so, ok, maybe she really did just have to use her own passwords, but either way they overdid it. Otherwise, it's always good to see Clark and Lois exercising their investigative muscles, and Clark's bridge-of-the-nose-rubbing "I hate magic" line was good character work. I don't have enough familiarity with either Faust's or Bones' histories to know whether the Faust-on-top dynamic between them here is standard fare or not, but I have to admit I found it compelling. Finally, the reunion of Steve and Diana was pleasantly, appropriately awkward and all around fun (while the moment where she finds the football is perfectly touching). Somehow I doubt she's going to end up arrested, though. Art - 5: Yeah, I just... I mean... yeah.